I'm thrilled that the Tallulah Falls Museum is finally getting some new exhibits. Of course, the Padgett Collection of antique textiles is only on loan, but at least our small town is getting a much-needed dose of culture. The museum has put photographs of some of the items to be displayed in the exhibit on their website, and there is a vintage Sivas rug that I can hardly wait to see in person. The rug--or kilim--is from Turkey and features threads in varying shades of orange, brown, blue, and lavender. I'm sure the photo on the site doesn't do it justice. Marcy told me that our friend Vera Langhorn said the collector might be willing to part with a few pieces. Let me tell you, Marcy and I had a good laugh over that. One doesn't buy museum-quality art on a librarian's salary. That's what I do, by the way--I'm the librarian. My husband Manu is the chief of police. And you don't buy museum-quality art on a police chief's salary either. Marcy assures me that entrepreneurs can barely afford the admission to look at museum-quality art. If I could afford that Sivas kilim, I certainly wouldn't put it on my floor and walk on it. I'd hang it in a glass display case and admire its beauty every day. My husband just informed me that there might be an alleged art thief in town, and the department is concerned that he'll target the exhibit. He said the man once confessed to stealing a priceless painting because--according to the note he left behind--the piece wasn't appreciated. I find it rather difficult to argue with that man's motivation. I'd never condone his stealing it, of course, but it breaks my heart to think of art being unappreciated. In keeping with the Killer Characters' Cozy Days of Summer Giveaway, please leave a comment below telling me what unappreciated thing saddens you. 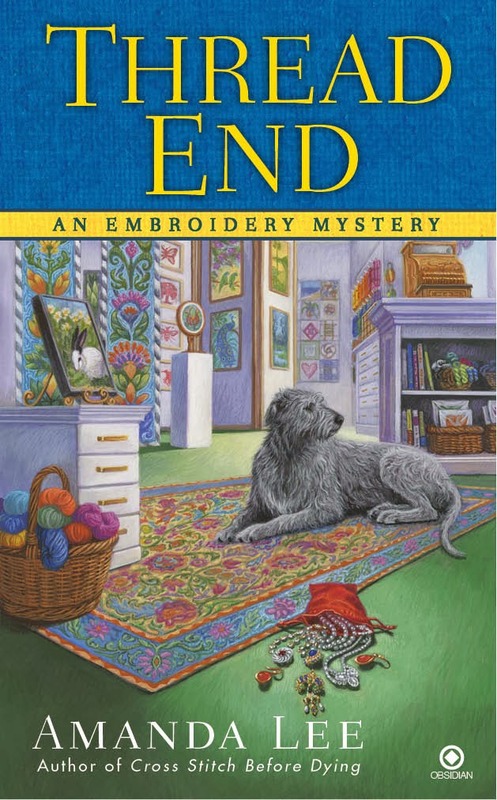 One winner will receive a signed copy of THREAD END. Don't forget to include your e-mail address so you can be notified if you win! What saddens me the most is those who do not appreciate what they have in search of what they want. Family, friends, a roof over their heads and food on the table. In their rush to get ahead they loose so much. Public workers, the new despised and denigrated.group. As someone who it took 2 years to find a decent job, and now, after 17 months, will be leaving said job to get married and move and restart the job hunt, it is very disappointing to hear people (even co-workers) complain so much about their job. They should be happy to simply have a job to go to that can help pay the bills. Not everyone will appreciate every piece of art but it's good to be exposed to different styles. Some people are always complaining about what they don't have instead of appreciating what they do have. A loving family is so nice and some people just take them for granted. Mosquitoes are unappreciated, and I mean, really unappreciated! Maybe if we appreciated them more they would stop biting! People that do rescue work with animals are so unappreciated. Those who help out in so many ways and never get a response - not even a smile or thank you. Alas, we underappreciate the little things - the dew on the tip of a blade of grass, the wonder in a child's eyes watching a firefly, the patience of a turtle making its way to the water, a hawk soaring overhead, keeping an eye on it all. There is an art to this - to stop for just a moment, to look, to listen, to enjoy what is in front of us *right now,* whether it is the engineering of a vehicle or a sculpture in a garden, or to simply hold the hand of someone we love. So many good books to start looking for!! First responders whether it be the police, firemen or paramedics are underappreciated as well as our military, for without them we wouldn't be free. I agree with Liz... Everyone needs to begin appreciating the little things in life. Thanks for the chance to win! Our military, and those others who help keep us safe; police offers and fire personnel. People who don't appreciate their little ones. I work in retail and time after time I'll see a little one sitting in a shopping cart while the parent is on the phone the whole time they are there. This is a learning time and time to associate with you kid, but they are taken for granted. I wish they would just enjoy the time because they are little for such a short time. People who rescue animals are often underappreciated. It's hard to rescue an animal, care for it, nutse it bsck to health, and then part with it. Kudos to all who do that. When you go to a lot of trouble to find the perfect gift for someone and they don't even bother to say thank you. That really annoys me. The lack of appreciation that teachers receive. They have such a difficult and important job, and yet they are underpayed and generally disregarded. How sad. I'm new to this, so I hope I am entering the daily contest correctly. when i send a card or gift for a special occasion like a birthday or wedding and get no response. I don't know if they got it or liked/disliked it. I always call or send a note or text when someone in acknowledgment. Ok, I think the little things in life go unappreciated. Like the person who holds open the door for you, those little common courtesies. I know I really appreciate them, and I try to teach my son those special gestures. People who don't appreciate their precious pets. That upsets me greatly. People should appreciate the elderly. There are so many unappreciated things. A smile is one the most. Teachers are under appreciated. I'm reading the series and appreciating it greatly! ;) thank you, Amanda/Gayle! It breaks my heart when I think how many children are unappreciated by their parents. Too many children suffer abuse &/or indifference by the very people who should love them the most. I love all these authors and series~~~~!!!!!!!!! Having lost my mother a year ago, it saddens me when I see people not appreciate their life , and ones that love them . Life is too, short love every minute !